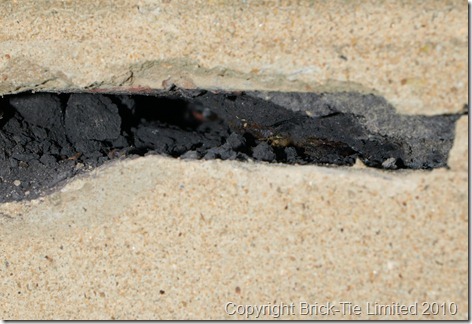 You are here: Home / Cavity Wall Ties / Guaranteed wall tie replacement – oh dear..
Last week I had the misfortune to be asked to check another wonky remedial wall tie installation. My client lives in Morley, Leeds and had his wall ties replaced about 12 years ago. His house is detached, brick-built, with large areas of external render. It is cavity wall insulated. He wants to decorate the render, which is a bit worn out and needs a spruce-up. However, he noticed widespread horizontal cracking, much of which extends through previously repaired areas. 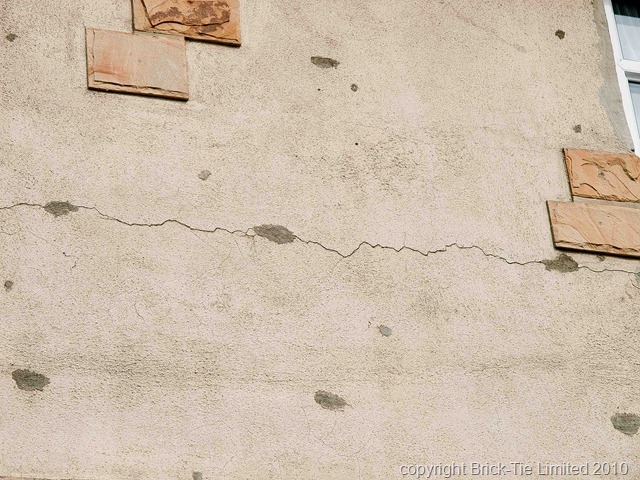 He has tried to contact the original wall tie specialist, to claim on his guarantee, but no joy; they’ve disappeared. Anyway, he found me and I’ve had a look. As can be seen at first glance, the job was incorrectly done and any specialist could see this from the street. However, a layperson would not know this and maybe wouldn’t care – after all, wall tie work is a distress purchase, which a customer often has little knowledge about and doesn’t really want done anyway. Domestic work is usually required as part of a house sale. Sadly, this leaves customers vulnerable to con men. In this case the ‘specialist’ has gone through the motions of the job, without actually making any effort to do things right. This is why the house is still cracking and our customer has a financial headache. His guarantee is worthless and he has to tackle continued cracking; he can’t just paint or render over the problem. So, what to look for and how to avoid being conned like this when looking for a wall tie specialist? Let’s look at how this chap got mixed up with a crap firm. 1 – The firm was recommended by the estate agent, when our customer bought the house. He took this as some sort of accreditation “The Estate Agent said they were very good”. This is the classic mistake to make. When an estate agent describes any company (including mine), as ‘very good’, what they usually mean is that the specialist attends to the survey promptly and produces a report and quotation quickly. Naturally, this is all the estate agent is interested in; the sale is being held up because these reports are required. Once any quotes are received and any negotiations between vendor and buyer are complete, the agent loses any interest. Why should they be involved thereafter? The sale has gone through – job done. This doesn’t mean that the recommended firm is not any good – it means they’re good, from the perspective of the estate agent. What the buyer needs is a firm which is very good, from the customers perspective. He wants an efficient survey and report AND if work is needed, reliability, competence, safety, value, efficiency and a guarantee which is worth something. Most Estate Agents don’t know or don’t care about these things. Yet they are crucial for the customer. 2 – The customer did not check any other markers or signs which would have caused him to delay placing the work with the cowboy firm. By this I mean easy things like membership of an established trade organisation such as The Wall Tie Installers Federation or The Property Care Association. In this case the ‘specialist’ was not a member of either and in fact was not even a member of The Federation of Master builders, which is the minimum a customer should look for, even when simple building repairs are involved, never mind important and invisible structural repairs like wall tie replacement. Trustmark and such are gaining ground now too, but they weren’t around in 1997 so fair enough. 3 – The specialist was a sole trader working from home. Nothing wrong with that for starters, but if the company is a fledgling one man band, what is it doing issuing 25 year guarantees? Are these Guarantees worth anything? Probably not. And even if they are, does a one man band have the financial and manpower resources to deal with unforeseen problems; on the customer’s contract or another? This is the main reason small firms fail. Customers are always the ones to lose out when they do. 4 – Once the job was done, nobody checked the work; the specialist installer certifies the standard of the job himself – we all do that these days, so we hold customers in the palm of our hands, they don’t know if we have done the job right or wrong. This situation is ripe for abuse. 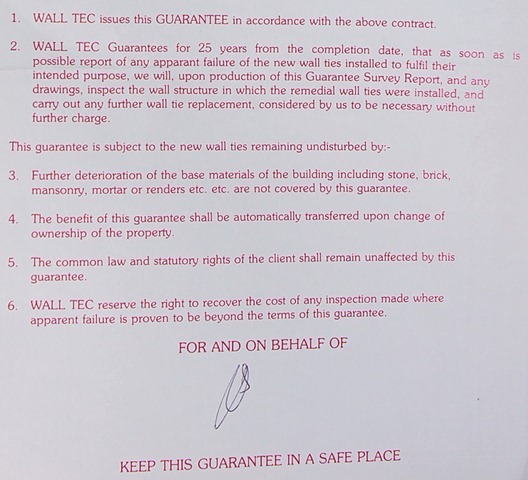 In the 1980’s all wall tie replacement was subject to independent certification by qualified structural engineers – expensive, but it would have paid dividends for this customer –he would not now be faced with paying for the work to be re-done. We offer this service for all clients as an extra layer of assurance, not many take it up; usually only those having very high value or complex repairs do so – but if we didn’t have such good credentials, I’m sure more would do so. It’s a worthwhile option, if a customer wants to use a cheaper builder or one man band for a job and feels some guidance and overseeing is needed. 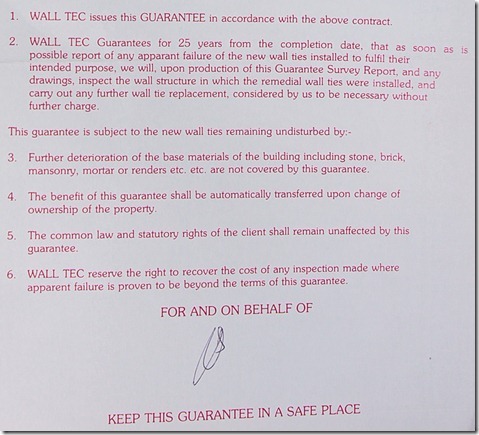 If you need a wall tie replacement survey – get two or three surveys – use PCA or WTIF member companies and if in doubt, get a structural engineer to supervise and certify the work. Don’t pay the bill until he is happy.